The recent flare-up along the Israel-Gaza border gave rise again this week to speculation and concern over whether there will be another large-scale confrontation in Gaza and what will happen if Egypt gets dragged in. Prime Minister Benjamin Netanyahu hinted at a possible war in Gaza this week, saying, “The IDF is ready to expand activity and will continue to pursue it as needed.” Earlier in the week, IDF Spokesperson Brig. Gen. Yoav Mordechai told Army Radio that “while it is too early to call up army reserves, the IDF is prepared for this optionand for the possibility that political leaders will seek to intensify the fighting in Gaza.” The comments came after terrorists fired more than 150 rockets into Israel, injuring at least a dozen civilians, and after IDF retaliatory strikes left at least 26 Palestinians dead. 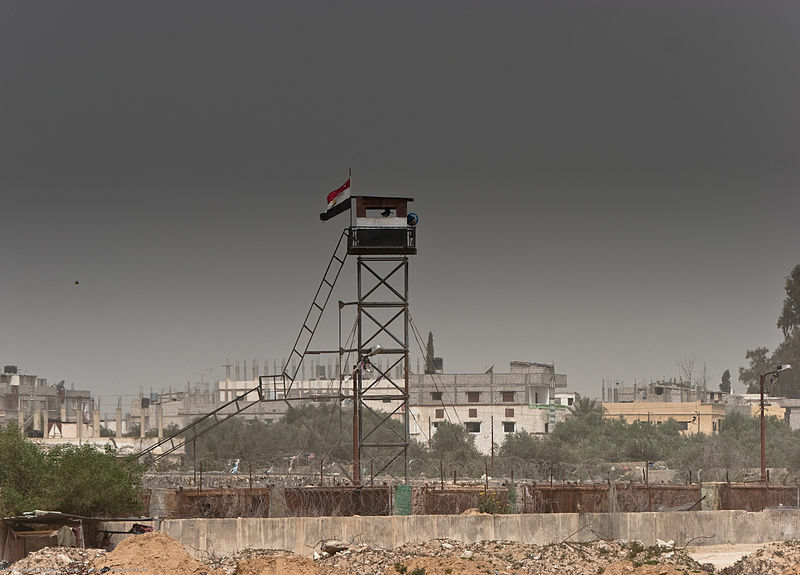 A watchtower at the Rafah border crossing between Egypt and Gaza. Photo by: Marius Arnesen, Share Alike 3.0 Norway License. But while rounds of escalation between Gaza terrorists and the IDF have transpired for years, regional dynamics could now shift considerably with the emergence of a new player on the field: an Islamist-strengthened Egypt. Where will this new Egypt stand should the situation in Gaza spiral into a larger confrontation or war? With Mubarak now gone, and the Muslim Brotherhood’s Freedom and Justice Party increasing its political clout in Cairo, Hamas has seized on an opportunity to consolidate its relations with revolutionary Egypt and bolster its position in Gaza vis-a-vis Israel. The new Egypt has already shown signs of warming up to Hamas. In a sharp departure from Mubarak’s policies, Cairo’s new leaders eased a four-year blockade on Gaza last year, permanently opening the Rafah border crossing, albeit with some restrictions. Earlier this year, Egypt authorized the entry of Mousa Abu Marzouk, the deputy head of Hamas’s political bureau, into Cairo after he left Syria. And just last month – in a move that showcased the Muslim Brotherhood’s ascendancy and would have been unimaginable under the former regime – Hamas Prime Minister Ismail Haniyeh was invited to give a speech at Egypt’s revered Al-Azhar mosque and university. Analysts have already pictured some of the dismal scenarios Israel would face should the relationship between Hamas and Egypt turn into a similar alliance that Hamas, until recently, firmly had with Iran: An Islamist Cairo would grant diplomatic legitimacy to Hamas, therefore ending the regime’s political isolation; terrorist groups would enjoy free reign in the Sinai and the increasing power vacuum there would enable Hamas to freely smuggle weapons into Gaza (this has already been happening); relations with Israel could be severed; and while Cairo may not go to war with Israel if it attacks Gaza, it could very well launch a war if the IDF carries out counterattacks on the Sinai against terrorists operating there. But Israel should not give up all hope on Egypt just yet. “Egypt hasn’t changed entirely,” Professor Ephraim Inbar of the BESA Center tells me. “After all, the Islamists only have an electorate victory, but they are not in power.” Egypt’s Supreme Council of the Armed Forces (SCAF), led by Mohamed Hussein Tantawi, who previously served as Mubarak’s defense minister, is the only authority allowed to make decisions on relations between countries, and it is far less hostile toward Israel than the Islamist parties. It is also wary of changing the status quo with Israel for fear, among other reasons, of damaging its relationship with the U.S. When Egypt’s new government is formed, the Freedom and Justice Party will have to take into account the interests of the SCAF, especially security interests, if it wants to be on good grounds with the military. Furthermore, it is not entirely certain that the Islamists will rush to Hamas’ side if the situation in Gaza spirals into a full-blown confrontation. “Obviously there is a greater ideological affinity between Hamas and the Muslim Brotherhood, but the Islamists have to feed their people,” Inbar tells me. Earlier this month, Khaled al-Qazzaz, the Freedom and Justice Party’s foreign relations coordinator, echoed this stance when he said his party will make its foreign policy decisions according to Egypt’s security needs. “We are, of course, closer to Hamas because we are both parties with an Islamic reference and a similar political ideology … but when it comes to international politics, you have to take into consideration your own country’s interest and other countries’ interests,” he said. Qazzaz’s comments are telling; they suggest that even an Islamist-ruled Egypt may have to sacrifice its defense of Hamas to preserve its own defense. If the Muslim Brotherhood feels like its own interests are at risk, it may have no choice but to loosen its support for Hamas. Egypt “is too busy right now to get engaged in anything outside its borders … It’s a matter of interests,” former Israeli Ambassador to Cairo Eli Shaked told The Wall Street Journal. In a bid to avoid any large confrontation that could erupt on its eastern border, Egypt worked actively this week to broker a shaky truce between Israel and Gaza. Finally, and in the best case scenario for Israel, the new Egypt may have a moderating effect on Hamas. “The Brotherhood has been frank with Hamas and told them: ‘You have to be reasonable and moderate, or else we will not support you. If you follow the policy of terror, we will break our relations with you,’” Mamoun Abu Shahla, a Palestinian businessman in Gaza who was involved in mediating the Hamas-Fatah unity deal last May recently told The National. Hamas knows it will not be able to strengthen its control over Gaza and its relations with Egypt if it is at odds with the Muslim Brotherhood. With its sights set on these goals, Gaza’s rulers could change some of their hostile policies toward Israel, or, at the very least, steer clear of provoking a regional confrontation. « US policy on Iran: Wedged between Russia and the GCC? I really liked the scenario in this article says Egypt will moderate Hammas. It is very interesting aspect.